It is the mouth you notice first, an enigmatic half-smile that draws you in. There are the eyes, wide and inviting, that cute black button nose… And, just like that, I’ve fallen in love with Google’s self-driving car. It is a ‘moonshot’ project, a vision of the future, with no steering wheel, gears or brakes – a vehicle so sophisticated it can negotiate traffic entirely by itself, read road signs, change lanes, and even execute emergency stops. It’s no exaggeration to say that the Google car could transform our everyday lives, and I have just become the first Briton, in fact the first person from outside America, to ‘drive’ it. The market in autonomous cars is developing fast, and our own Government has already announced pilot tests in three cities starting next year. 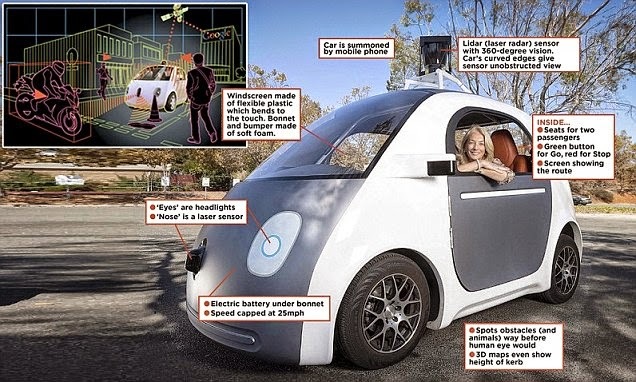 But this futuristic Google prototype is streets ahead of what any other manufacturer is offering so far. Its curved edges are practical as well as visually appealing, designed to allow the lasers, sensors and cameras mounted on top of the car in a rotating casing known as a ‘lidar’ to have optimal vision around the vehicle. The ‘eyes’ are headlights. The ‘nose’ is a laser sensor and radar. If it wants a good view of what is coming up, it bounces a beam beneath the car ahead and takes a look. The car’s body is made from lightweight polycarbonate. The windscreen is a flexible thick plastic that bends to the touch. The bonnet is soft foam that would minimise the impact in the unlikely event, according to Google, of a collision. THE car has not yet been on public roads. In California, all drivers must be able to take ‘immediate physical control’ of a vehicle for it to be able to travel on the state’s roads. The car will be allowed in ‘real’ traffic in a few weeks’ time, when it will go on trials with a safety driver and a steering wheel.